Labour markets or job markets function through the interaction of workers and employers. 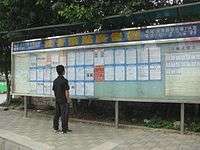 Labour economics looks at the suppliers of labour services (workers), the demands of labour services (employers), and attempts to understand the resulting pattern of wages, employment, and income. Structural unemployment — This reflects a mismatch between the skills and other attributes of the labour force and those demanded by employers. If 4 workers each take six months off to re-train before they start a new job, the aggregate unemployment statistics will record this as two unemployed workers. Rapid industry changes of a technical and/or economic nature will usually increase levels of structural unemployment, for example: widespread implementation of new machinery or software will require future employees to be trained in this area before seeking employment. The process of globalization has contributed to structural changes in labour, some domestic industries such as textile manufacturing have expanded to cope with global demand, whilst other industries such as agricultural products have contracted due to greater competition from international producers. 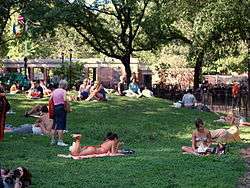 Demand deficient unemployment — In Keynesian economics, any level of unemployment beyond the natural rate is most likely due to insufficient demand in the overall economy. During a recession, aggregate expenditure, is deficient causing the underutilisation of inputs (including labour). Aggregate expenditure (AE) can be increased, according to Keynes, by increasing consumption spending (C), increasing investment spending (I), increasing government spending (G), or increasing the net of exports minus imports (X−M). However, the labour market differs from other markets (like the markets for goods or the financial market) in several ways. Perhaps the most important of these differences is the function of supply and demand in setting price and quantity. In markets for goods, if the price is high there is a tendency in the long run for more goods to be produced until the demand is satisfied. With labour, overall supply cannot effectively be manufactured because people have a limited amount of time in the day, and people are not manufactured. The labour market also acts as a non-clearing market. While according to neoclassical theory most markets have a point of equilibrium without excess surplus or demand, this may not be true of the labour market: it may have a persistent level of unemployment. Contrasting the labour market to other markets also reveals persistent compensating differentials among similar workers. 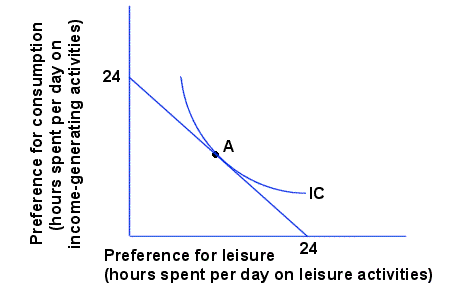 This can be shown in a graph that illustrates the trade-off between allocating time between leisure activities and income-generating activities. The linear constraint indicates that there are only 24 hours in a day, and individuals must choose how much of this time to allocate to leisure activities and how much to working. This allocation decision is informed by the indifference curve labelled IC. The curve indicates the combinations of leisure and work that will give the individual a specific level of utility. The point where the highest indifference curve is just tangent to the constraint line (point A), illustrates the optimum for this supplier of labour services. If the substitution effect is greater than the income effect, the labour supply curve (in the adjacent diagram) will slope upwards to the right, as it does at point E for example. This individual will continue to increase his supply of labour services as the wage rate increases up to point F where he is working HF hours (each period of time). 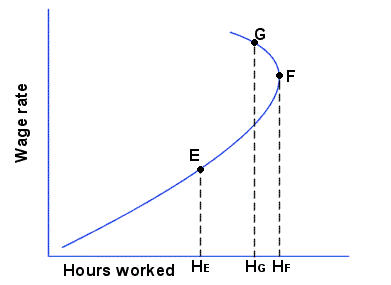 Beyond this point he will start to reduce the amount of labour hours he supplies (for example at point G he has reduced his work hours to HG) because the income effect of the wage rate has come to dominate the substitution effect. Where the supply curve is sloping upwards to the right (showing a positive wage elasticity), the substitution effect is greater than the income effect. Where it slopes upwards to the left (showing a negative wage elasticity), the income effect is greater than the substitution effect. The direction of slope may change more than once for some individuals, and the labour supply curve is different for different individuals. Labour demand is a derived demand; that is, hiring labour is not desired for its own sake but rather because it aids in producing output, which contributes to an employer's revenue and hence profits. The demand for an additional amount of labour depends on the Marginal Revenue Product (MRP) and the marginal cost (MC) of the worker. The MRP is calculated by multiplying the price of the end product or service by the Marginal Physical Product of the worker. If the MRP is greater than a firm's Marginal Cost, then the firm will employ the worker since doing so will increase profit. The firm only employs however up to the point where MRP=MC, and not beyond, in neoclassical economic theory. The value of marginal physical product of labour ( ) is the value of the additional output produced by an additional unit of labour. 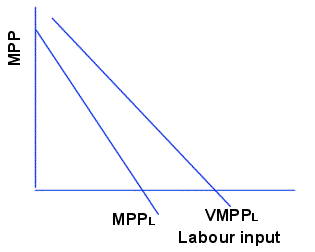 This is illustrated in the diagram by the VMPPL curve that is above the MPPL. 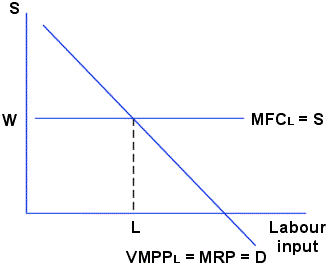 In perfectly competitive industries, the VMPPL is in identity with the marginal revenue product of labour (MRPL). This is because in competitive markets price is equal to marginal revenue, and marginal revenue product is defined as the marginal physical product times the marginal revenue from the output (MRP = MPP * MR). The marginal revenue product of labour can be used as the demand for labour curve for this firm in the short run. In many real-life situations the assumption of perfect information is unrealistic. An employer does not necessarily know how hard worker are working or how productive they are. This provides an incentive for workers to shirk from providing their full effort — since it is difficult for the employer to identify the hard-working and the shirking employees, there is no incentive to work hard and productivity falls overall, leading to the hiring of more workers and a lower unemployment rate. One solution used recently - stock options - grants employees the chance to benefit directly from a firm's success. However, this solution has attracted criticism as executives with large stock-option packages have been suspected of acting to over-inflate share values to the detriment of the long-run welfare of the firm. Another solution, foreshadowed by the rise of temporary workers in Japan and the firing of many of these workers in response to the financial crisis of 2008, is more flexible job- contracts and -terms that encourage employees to work less than full-time by partially compensating for the loss of hours, relying on workers to adapt their working time in response to job requirements and economic conditions instead of the employer trying to determine how much work is needed to complete a given task and overestimating. ↑ De Meza ; Webb, David ; David (March 1990). "Risk, Adverse Selection and Capital Market Failure". The Economic Journal. ↑ "Job Market Signaling". Quarterly Journal of Economics. The MIT Press. 87 (3): 355–374. 1973. doi:10.2307/1882010. JSTOR 1882010. ↑ Paul Oyer and Scott Schaefer, 2011. "Personnel Economics: Hiring and Incentives," ch. 20, Handbook of Labor Economics, v. 4B, pp. 1769–1823. Abstract and pre-pub PDF. Assar Lindbeck and Dennis J. Snower 1986. Wage Setting, Unemployment, and Insider-Outsider Relations, American Economic Review, 76(2), pp. 235–239.